I’m jumping back to California for a quick three-part mini-series from the Mineta San Jose Airport. I shot these with the Canon G7X Mark II, on my way back to Austin. As much as I like my Olympus PEN camera, which is not very large, a small compact camera is nice to whip out in a pinch and generally attracts less attention in a place like this. 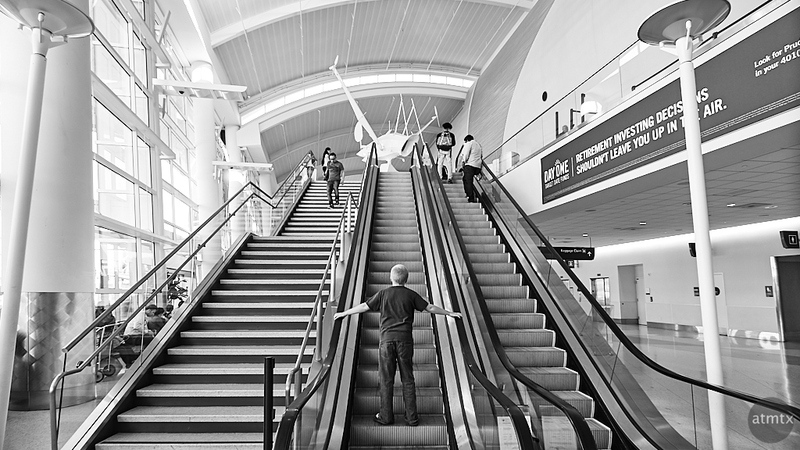 I shot leading lines on long escalator and stair runs before, but this one with a boy, adds a nice focal point. The people at the top just happen to balance each other on the left and on the right. While it might not be a huge innovation, this is the first time I created a wide-angle Cinematic in black and white. I also processed this RAW with my usually contrasty monochrome setting, however, since the room was so bright and mostly white, there’s not much contrast.